The flat bottomed boat glides through the Mangrove glade in the predawn lavender light. Valdemar expertly poles us along. Fishermen cast weighted nets in the shallows. They are fishing for shrimp. The boats are weathered and wooden. Great White Herons fish the shallows, along with kingfishers and endless other birds. Tiny fish leap away from our quiet vessel in the hundreds. Quattro Ojos, four eyed fish skim the surface like flying fish. Mangroves reach their branches down and form walls to the water. This sunrise tour of the mangroves support sea turtle and caiman conservation. We love it. Even Finn was allowed to come along. He loved the birds, and the four- eyed fish. 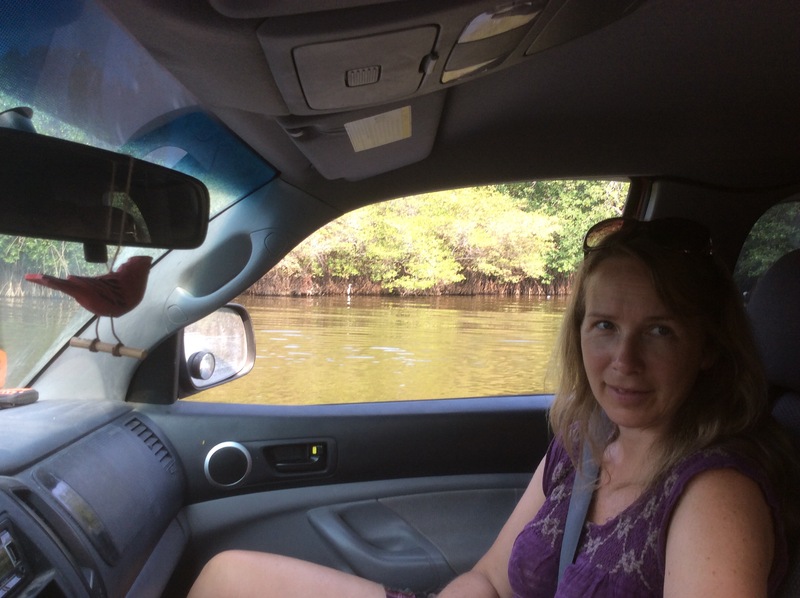 The water in the mangrove swamp is no more than six feet at it’s deepest. We had heard that there was a ferry that ran to a village on the inland end on the laggoon. 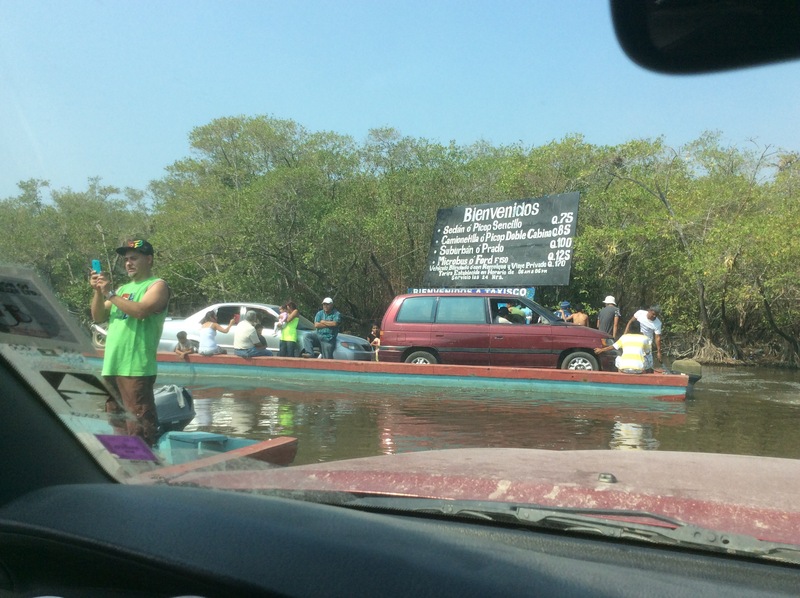 A trip on this ferry would save us from having to retrace almost two hours of rough Guatemalan dirt roads alongside miles of sugarcane fields. We had spent our last night in Guatemala in a suffocating room on the Pacific. The tour was a pleasant way to end our stay, and a highlight. We walked back to the hotel, ate breakfast, and packed. We drove toward where we thought the ferry was. “Si,” and he pointed to his right. He gestured for us to line up car with what looked like something not quite suited for Huckleberry Finn’s trip down the Mississippi. He motioned us forward, then to stop! 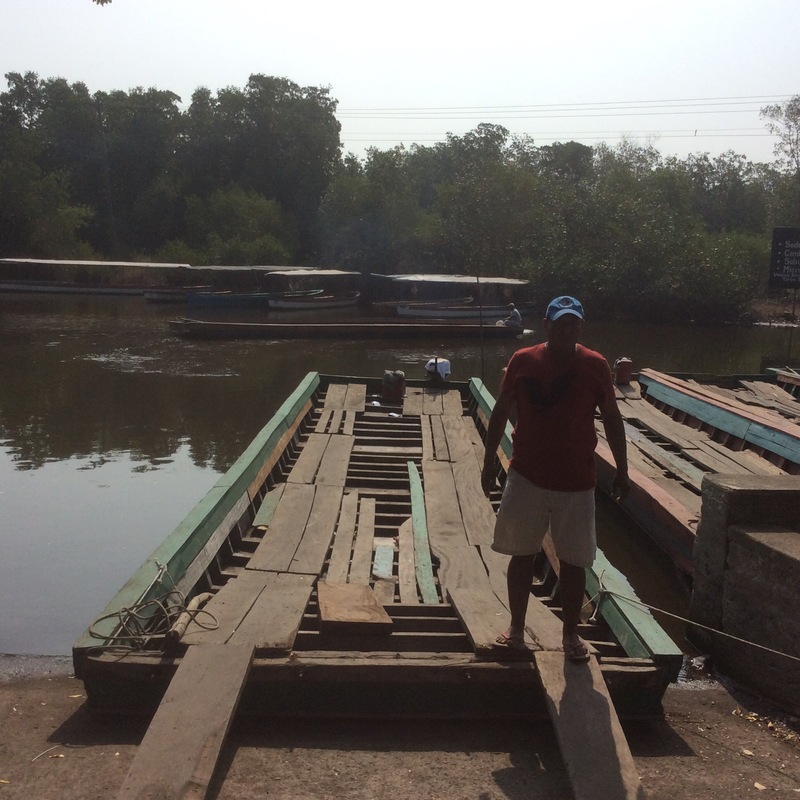 He aligned some planks with our tires, and the wooden tracks on the boat. I gulped and he motioned us forward. 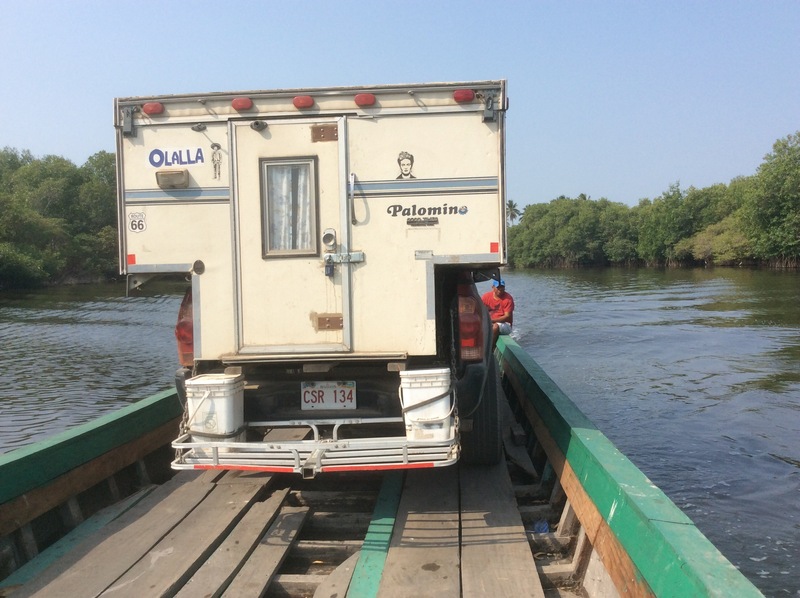 Slowly, gingerly we craft on board the barely twelve foot wide, forty two foot long ferry. Loaded, it couldn’t have draughted much more than half a foot. It was he fired up an outboard motor and we were off. We followed the same waterway that we had been poled along a few hours earlier! Same birds. Same fishermen. Same mangroves. Same flat bottom all wooden construction. Different design. Same shallow water. Easy to hit unseen sunken logs, or run aground. We passed other’ferries’, some with two vehicles, going in the opposite direction. The passengers on these were equally amazed. It was a tad harrowing backing off. The air was smoky and smelled of my recently burnt clutch. In the truck, it was smiles all around. That was the best thirty dollars I had spent in a long, long, LONG time.